Paul Norden and his brother, JP Norden, were severely wounded in the Boston Marathon bombing last April. Together with author David Smitherman, they have written Twice As Strong: 12 Seconds, 2 Brothers, and the Marathon That Changed Their Lives. Q: Why did you decide to write this book, and how did you choose "Twice As Strong" as the title? DS: I had heard about the Nordens after the tragedy and was amazed by how they were affected and how they were dealing with the challenges they faced. 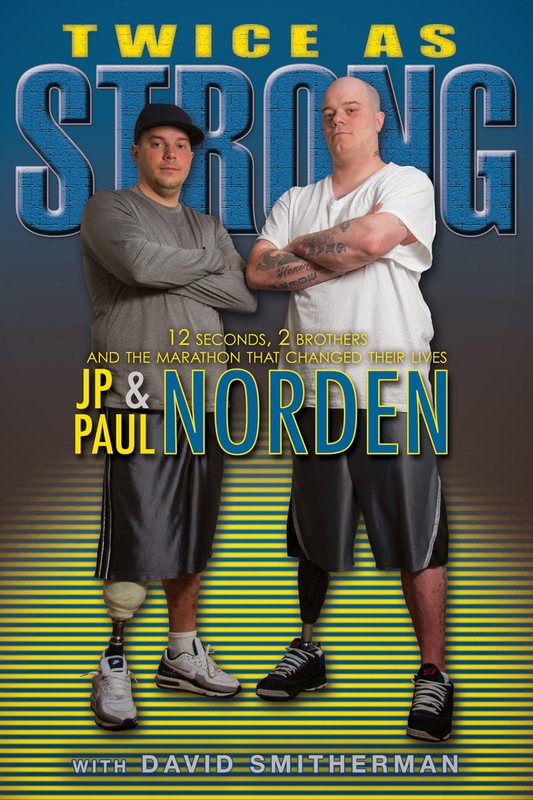 Then a few months later my agent contacted me to help two Boston Marathon survivors with a book, and it turned out to be JP and Paul Norden. I was excited to help them tell their story, and I thought their choice of a title was perfect and played nicely on the Boston Strong mantra. Q: How difficult was it to revisit the events of and following the marathon as you wrote the book? PN: For me it was quite difficult revisiting the events after the marathon. I did not like seeing my brother or my girlfriend injured and hearing about that was hard on me. I was in a coma for the first week so I learned about their injuries and difficulties as we wrote the book and it was heart wrenching. I could handle hearing about my own injuries, but hearing about people you love is very hard. DS: When I interviewed everyone involved, I could tell it was still very emotional and difficult, but they were eager to tell their story, their way, and they knew a book was the best way to achieve that. The book is written in their voice, but in a third-person perspective to give a complete picture of all of the people involved. Q: How did the three of you collaborate on the book? What was the writing process like? PN: It was easy to share our story with Dave. There was a lot of talking and interviewing, but Dave made the process relaxing and fun. Every time I would remember something new, I would send him a message because I knew it should be in the book. From there, he would ask about all the details and emotions from that moment. DS: While working on the book, I talked with them a lot on the phone, through email, and even text messages. Then I flew to meet them and spend time learning more about them. It was interesting talking to everyone and getting their reflections on that day. There are so many emotional angles to their story that to me it was very important to provide a complete picture of what they have experienced. Q: What message would you like readers to take from your book? PN: The message I would like readers to take away from this book is – to never give up. In our book you hear how truly devastating our injuries were: legs were amputated, burns covered most of our bodies and shrapnel littered the rest. It was a very hard road when I first woke up -- my own injuries, my brother’s injuries and the injuries of our friends -- yet we never gave up, and pushed forward. We worked hard through the physical and emotional pain, but we never gave up. Now almost a year later, we are enjoying our ‘pretty normal’ lives. DS: The Nordens are such a humble, down-to-earth family that readers will be able to relate to them and their struggles. People will find themselves wondering what they would do if they found themselves in a similar situation. How would they respond? Would they rise to the challenge? Would they have the same support system? PN: For me, I am planning a wedding… my fiancée and I got engaged a couple of months ago, which we are very excited about. For JP and I, we hope to start our own roofing and sheet metal company so we can work together again. We will run the shop and business since going back on the roof is still very questionable at this point. DS: Since their story is still evolving, a paperback version of the book will come out in the fall with updates and more surprises. PN: We always like to say thank you to everyone for all of their support over the last 11 months. It truly meant the world to us and each person has had an impact on our recovery. The prayers, the support, the donations – Thank you from the bottom of our hearts. DS: Theirs is a timeless story that is not so much about the Boston bombing as the Boston bonding.